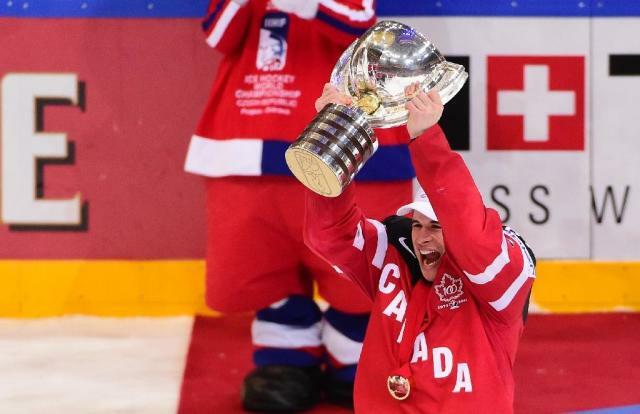 Prague (AFP) - Olympic champions Canada won the ice hockey world championship after sweeping defending champions Russia 6-1 in the final in Prague on Sunday. 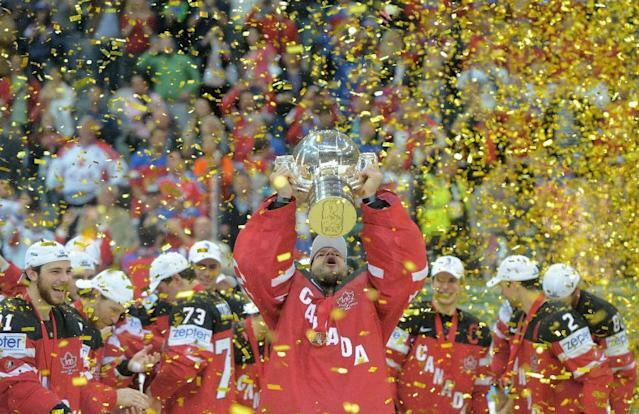 With a team full of NHL stars, Canada won their first gold since 2007 and the first medal at the worlds since 2009. The 2010 and 2014 Olympic champions have won all 10 games at the tournament, scoring 66 goals and conceding only 15. 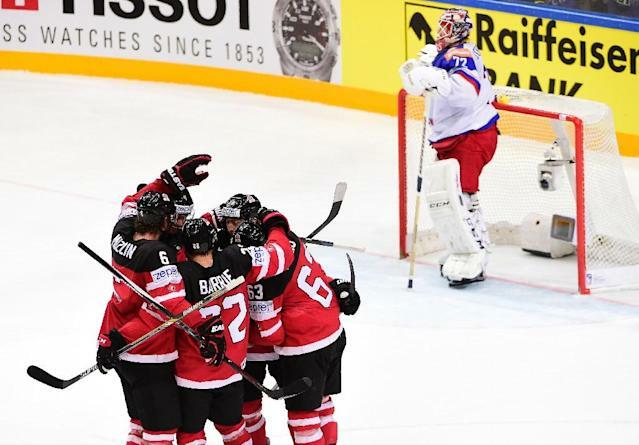 Canada dominated the final game, pouring 37 shots on Columbus goalie Sergei Bobrovski in the Russian goal, while the Russians only managed 12 shots. Canada pushed from the start but scored only in the 19th minute as Dallas wing Cody Eakin tipped in a shot by Buffalo forward Tyler Ennis. Ennis circled the Russian goal two minutes into the second period and took Russian goalie Bobrovski by surprise with a shot between his skate and the post for a 2-0 lead. Pittsburgh center Sidney Crosby made it 3-0 on 28 minutes after a pass by Edmonton wing Jordan Eberle from behind the Russian goal found him unguarded in front of it. Philadelphia center Claude Giroux broke away less than a minute later, failed to score but fooled Bobrovski and passed the puck to Dallas young gun Tyler Seguin, who scored into a gaping net for his ninth goal overall which made him the top scorer of the tournament. Crosby set up Giroux for a power-play goal on 49 minutes and Bobrovski failed to tame a wrist shot by Nathan MacKinnon a minute later. Pittsburgh star Evgeni Malkin scored a consolation goal for Russia four minutes later after tipping in a shot by Sergei Mozyakin. "That's why we all came, we came to win," Crosby beamed after the game, clutching the cup. "Today we played a great game. All the way through, a great team effort," added Crosby, who has joined the Triple Gold Club of players who have won the Stanley Cup, the Olympics and the world championships. San Jose defenceman Brent Burns said the win was unbelievable. "It's the first time winning something big for me and a couple other guys in the room and it's a pretty special feeling," he said. Against Russia, "we played pretty tight and kept chances to a minimum," added Burns. "We did what we had to do, that's what we worked on, playing our game, and we did that for sixty minutes." In contrast, the Russians had trouble finding words to explain the loss. "It's hard to say, I don't know. We tried everything," said Washington star Alexander Ovechkin. "We can't play like that in the final, we gave them too many chances and they're a pretty good team so they're going to use them." St Louis forward Vladimir Tarasenko managed a single sentence, saying: "They simply played better, we alone are to blame." Earlier on Sunday, the USA won bronze after beating the Czech Republic 3-0 with goals by Nick Bonino, Trevor Lewis and Charlie Coyle while goalie Connor Hellebuyck stopped all 39 Czech shots.